Playing shots from sloping lies is difficult. 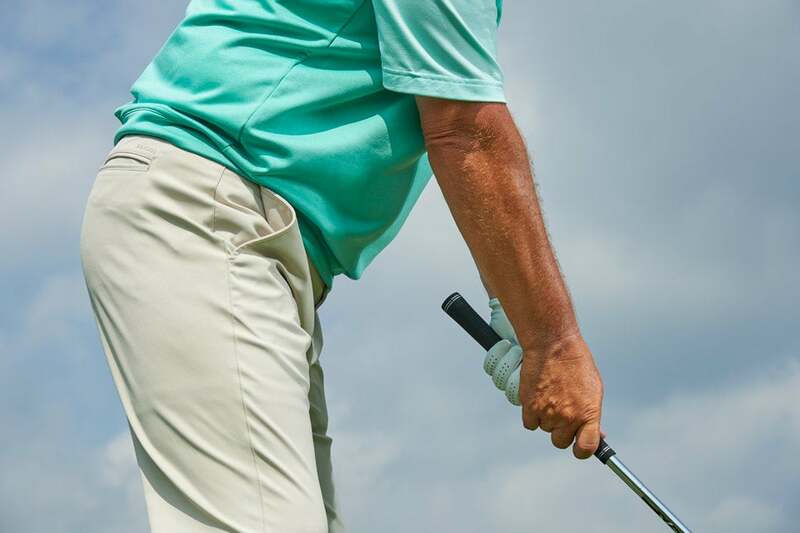 Not only does it require you to significantly adjust your setup, it typically demands in-swing moves that you rarely practice when you visit the range, which offers nothing but your standard, garden-variety flat lie. My first bit of advice, then, is to look beyond your mat when you practice and find some funky lies to try out a few of these puzzlers before they sneak up and bite you on the course. Even a little experience with slopes during training can pay huge dividends; if the only time you encounter a hilly lie is during your round, you can't expect to have much success. In general, what you're trying to figure out is how to adjust your posture and address position to make each of these uneven lies feel like they're more even. And just as important, how to find comfort in these stances so that you remain balanced and steady throughout your swing. I'll show you how, and not just for one common sloping lie, but four. Get ready to make the grade. A ball that lies above your feet sits closer to your body than it does on a level lie. If you grip it as you normally do, you're going to stick the clubhead into the ground behind the ball. The key adjustments are to choke down on the grip (almost to the metal), and because you're shortening the club, take one or two more than you might otherwise need. Your next adjustment is to lean into the hill, setting most of your weight out on the balls of your feet and keeping it there from takeaway through finish. It helps to stand a little taller, with your chin pointing at the ball. Just don't lock your legs straight — you need to remain athletic on this and any type of uneven lie. Setup checklist: Stand taller, choke down, aim slightly right, and keep your weight on the balls of your feet. Due to the lie and your taller posture, you'll swing flatter and the ball will tend to draw. 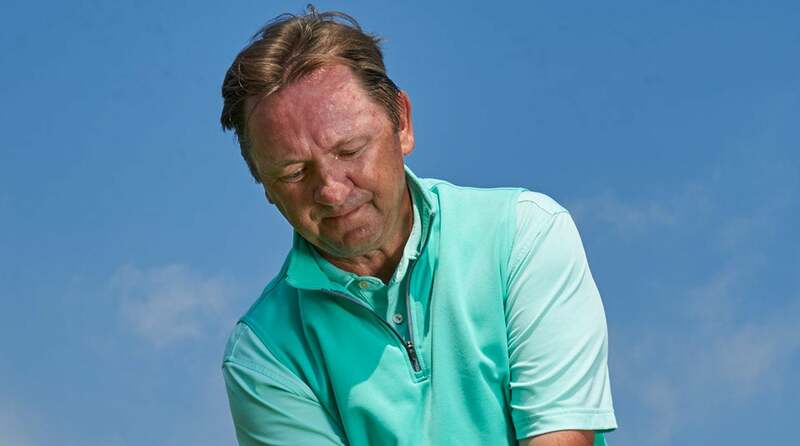 To adjust, aim slightly right of your target, but don't aim so far right that a straight shot gets you into trouble, because shots taken from a lie with the ball above your feet don't always draw. The ball is closer to you than you think. Slide your hands down the grip, almost to the steel. Uphill lies are the easiest to handle among the uneven set — you've got more ball to hit and a natural launch pad to hit soaring shots. Unless, of course, you're hitting into a breeze, where the combination of an uphill lie and a steady headwind will cause the ball to balloon up into the air and fall short of your target. So whatever you do, take more club. At setup, tilt your shoulders so your right is lower than your left (match the slope), and keep this tilt from start to finish. 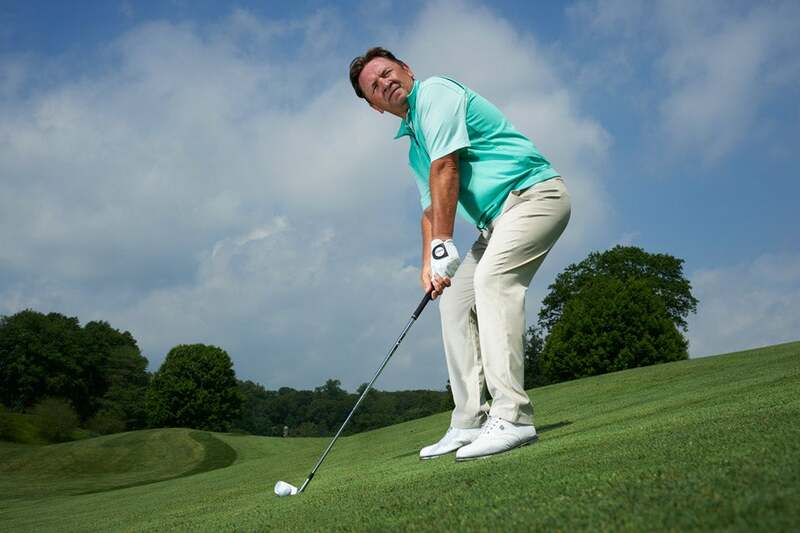 Play the ball a bit farther forward in your stance, and distribute most of your weight and ground pressure into your downhill foot, at setup and throughout. Prepare for liftoff by tilting your shoulders to match the slope. Just make sure you have enough club to reach your target. Unlike a lie where the ball is above your feet, fight the urge to lean into the hill. Simply rotate around your back foot, keeping your right glute and thigh activated. The final tweak: Flare your left foot. It'll help you turn faster from this lie. Set your weight over your back foot and keep it there. This lie is the toughest for mid- and high-handicappers. There are several factors working against you from this lie, not the least of which is the feeling that you're going to fall down the hill chasing after your ball. The ball is also farther away from you here, so you have to grip the handle at the very end, which can feel awkward. Your stance will feel funky as well, because you have to squat low for stability and to reach the ball. Keep the majority of your weight and pressure concentrated in your heels, and no matter how unnatural it may feel, keep it there all the way through to your finish. The tendency is to stand up out of this shot. You won't be able to rotate very well, so the strike itself tends to be a bit weaker. 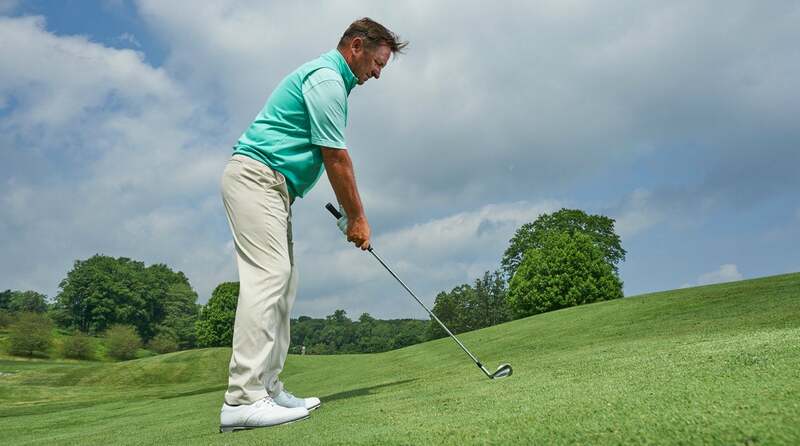 To top it off, a lie with the ball below your feet is likely to cause your ball to fade or slice, so aim to the left of your target accordingly. Maintain your squat posture and keep your weight in your heels. Play for the fade—and hope for the best. Think of a downhill lie as you and the ball situated on the same level, which will require you to adjust your setup so that your shoulders lean forward with the slope. Fight to maintain this shoulder angle all the way through impact. For this lie, set the majority of your weight over your front leg, and as you'd expect by now, keep it there. When you swing, pivot around your front foot. Your instinct will be to try to counterbalance your weight and shift your pressure back up the hill. Avoid this at all costs. You'll end up catching the ball either fat or thin. Caution: When you correctly lean and angle with the hill, your ball position effectively moves from center to center-back. This takes a little loft off your club, so be prepared for your shot to launch low and stay there. It'll likely run a bit more as well. It's natural to want to lean back up the hill to balance your body weight. Fight the urge.